Most people love potatoes whether they are fried, boiled or roasted. 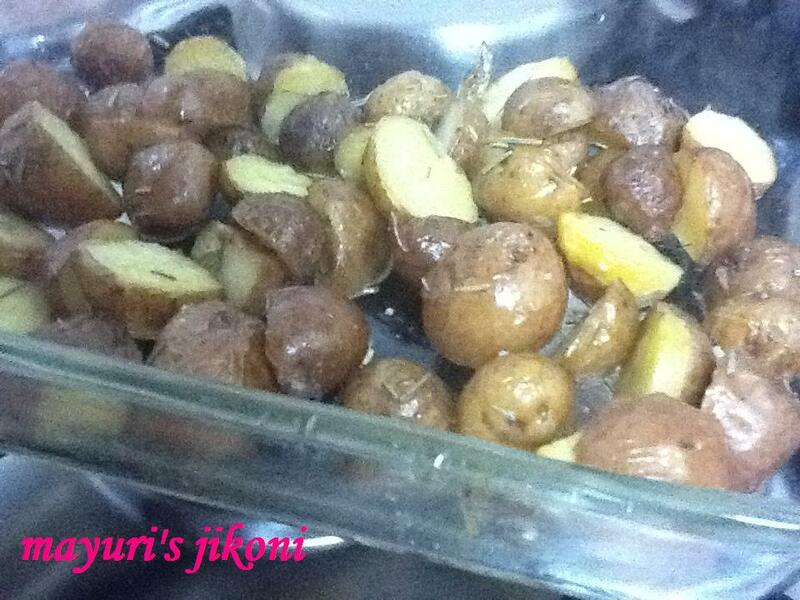 I love roasted potatoes and they make a great side dish to accompany a pasta dish or pizzas or in place of a salad. Just a few pieces of potatoes and your stomach is full. If I don’t get baby potatoes then I just use normal baking potatoes. In Kenya I use Meru potatoes. When I am in UK I get so confused with the variety that is available, my sister in laws buy them for me. The first time I had roasted potatoes was at my kaki’s place during one of my numerous visits. Ever since then, roasted potatoes are a common feature whenever I make continental dishes. I prefer to roast them with the skin, but you can peel the potatoes if you like. Wash the potatoes thoroughly to remove any mud that might be on it. If you are using big potatoes then cut them into big chunks(about 8 pieces per potato). Put some water to boil in a saucepan. Add the potatoes and 2 tsps of salt. Parboil the potatoes. Parboil means boiling them till they are half done. Drain out the water. Let the potatoes cool for a bit. Cut the baby potatoes into half. Put the potatoes in a bowl. Add the olive oil, salt, pepper and rosemary. Mix it well. Layer the potatoes onto a greased baking tray. Bake them at 180°C for 15 to 20 mins and grill it for 5 minutes so that they can become slightly brown. Can use any herbs of your choice like oregano, coriander, thyme etc. Add red chilli flakes or chopped green chillis if you like hot food. Add 2 to 3 cloves of chopped garlic. If you boil the potatoes till completely done then after mixing it with salt, oil and herbs grill it for 10 minutes only. To serve as a starter, use sour cream or thick yogurt as a dip. To make this dish in India, I usually soak the potatoes for an hour before boiling them. If you use baby potatoes, no need to soak them.